As readers of our blog already know, the American Heritage Center’s collections range far beyond the borders of Wyoming, of the Rocky Mountains, and even of the United States to international locations. One post, for example, presented the front-line war correspondence of one of our many journalists’ collections while another reported on the few but significant items we found to complement the visit to the Center by the US Ambassador to Tunisia. The title of this four-page newsletter is “Il vero et ultimo aviso della presa d’Affrica,” and it describes (in Italian) how Spanish and Italian forces successfully captured the fort of Mahdia, Tunisia, from the Ottoman Turks. 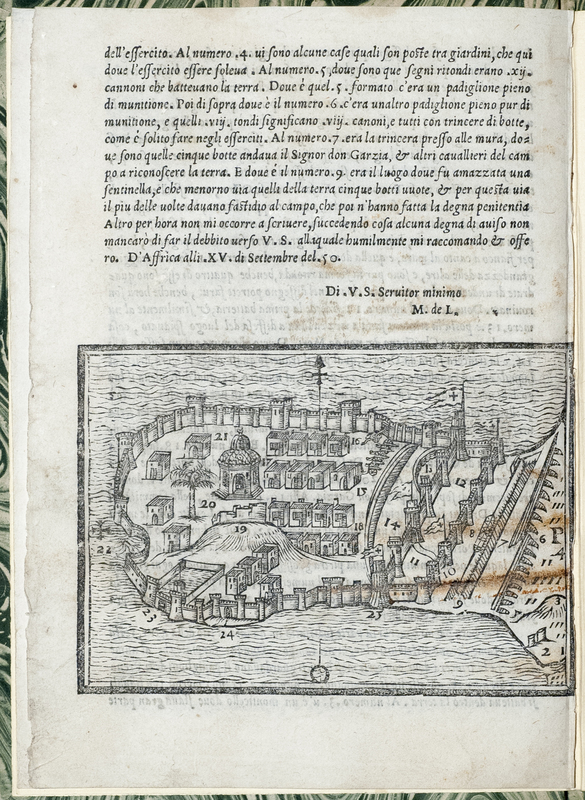 Title page from the pamphlet, which includes a medallion woodcut of the Holy Roman Emperor Charles V.
Back page of the pamphlet, containing a woodcut map of the Mahdia fort. These examples represent not only a tiny fraction of our international collections content but only one aspect of the AHC’s broader internationalism. Throughout the decades of the AHC’s existence some faculty and others questioned the decision to maintain a repository with content so far afield from Wyoming and the Rocky Mountain West. However, the benefit of such collections has been demonstrated again and again, for instance in the coursework UW teaching faculty have been able to build on our holdings and in the widely international clientele attracted to UW by the Center’s collections. This glance at the Center’s international collections and connections during roughly the past five years, is but a surface sketch of what is a deep and solid component of the AHC’s identity. The origins of the AHC date to 1945, when Grace Raymond Hebard donated to UW her personal collection of papers and artifacts documenting the history of Wyoming and the West gathered during her long career as a teacher, librarian, and trustee for UW. During the 1950s and through the 1980s long-time director Gene Gressley expanded the Center’s holdings far beyond Wyoming and the West, to include topics such as the radio, television, and film industries; US journalism; the national conservation movement; and economic geology, an industry where it was very common for a well-respected mining geologist to do work not solely in the Western US but also in many parts of the globe, particularly Africa and Central America. Acquiring the massive, indescribably important records of the Anaconda Mining Company brought 15 thousand cubic feet of records relating particularly to Central and South America into the Center’s holdings. In the early 2000s, the AHC’s holdings were thoroughly analyzed and a formal, more restrictive collection development policy developed. Creation of this policy was accompanied by massive reappraisal and deaccession of collections determined not to fit the new policy (over 400 collections totaling 15,000 feet), and many of these deaccessioned holdings were outside the borders of the US, the Center’s faculty and staff determined that certain international materials decidedly did fit our new, narrower collecting efforts. Most of these collections were the papers of Americans or US organizations with extensive international travel and/or strong international ties. Files labeled “Constituent Correspondence-Wyoming” cover various topics and concern the committee as a whole as well as immigration, patent, and other subcommittees. There is also information regarding an oversight hearing on the Justice Department’s Office of Special Investigation’s handling of Nazi war criminals living in the U.S. Regulatory reform and courts subcommittee materials are included with those of the Judiciary Committee. The Subcommittee on Immigration and Refugee Policy files document the legislative history and implementation of Simpson’s Immigration Reform and Control Act (also known as the Simpson-Mazzoli bill). Other topics include the annual refugee consultation with administration on the admission of refugees, findings of the Select Commission on Immigration and Refugee Policy (of which Simpson was commissioner), and the Miroslav Medvid political asylum incident. An even higher proportion of international material will, of course, be found in the papers of diplomats such as Thomas Stroock, US Ambassador to Guatemala: “From 1989 to 1992, Stroock served as U.S. Ambassador to Guatemala. Appointed by President George H.W. Bush, he held this position during a period in which Guatemala was making a difficult transition to democracy. During his ambassadorship, Stroock was noted for his advocacy of human rights and social justice in this Central American country.” As with the Simpson papers, many researchers have made use of the Stroock papers since we acquired them. These two collections are part of a strong set of holdings in politics and public affairs. The international content of Center collections runs far broader than these political examples. This was brought home to us early during my tenure when Professor of History Michael Brose applied for one of our Innovative Teaching Grants to develop a course titled “Asia Through American Eyes,” based on our hundreds of collections representing US travelers, business people, missionaries, diplomats, soldiers, and others who spent time in Asian nations from the latter 19th through the 20th century. Employing a graduate assistant to analyze the collections, Prof. Brose then made a selection of them available to students in the course to use for research papers. The course has been offered several times. A print and on-line guide identifies these collections. 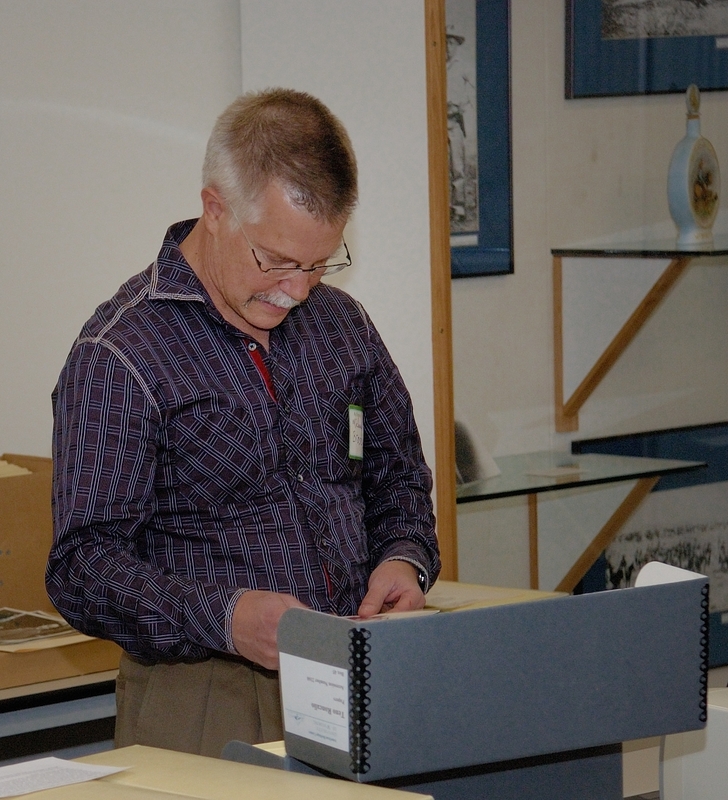 Professor Michael Brose with AHC collections. 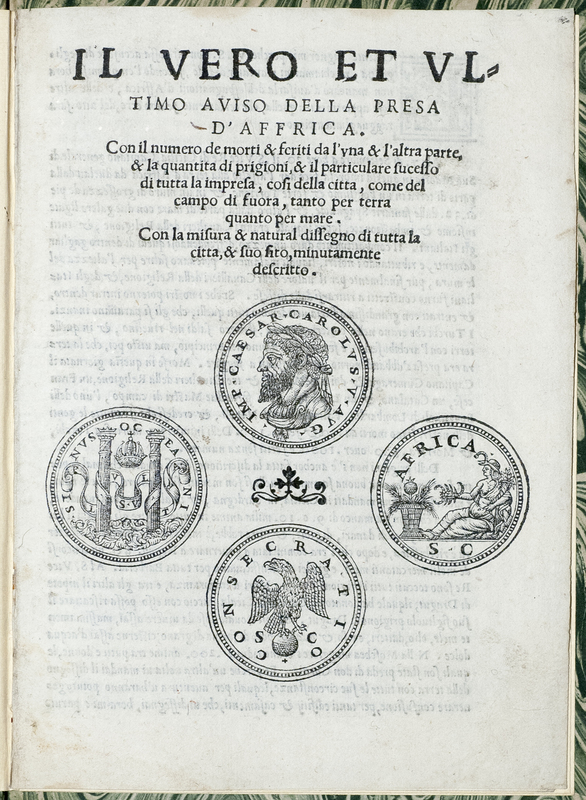 Such a guide also exists for our collections relating to Central and Latin America, begun, similarly, when the late Professor of History Adrian Bantjes received an Innovative Teaching Grant and employed a graduate assistant to survey the AHC’s relevant collections. A similar curriculum is being developed by Carolyne Ryan Larson as part of her “Historical Methods” course. The very existence of this guide has drawn additional researchers, both students and scholars, to our Central and Latin American collections. A significant portion of these collection relate to economic geology, both in the records of the Anaconda Mining Company (approximately 15% of its 15,000 cubic feet relate to Mexican lands and southward) and in the papers of the dozens of geologists whose papers reside at the AHC. Many of these same geologists also did work in southern Africa, and at least one of our Majewski Lectures was delivered by a South African scholar based on the papers of a handful of key individuals at the Center. Another set of international collections at the AHC are those relating to military leaders and common soldiers, many of whom fought and were stationed in foreign nations, from the Philippines through Vietnam. AHC collections even include correspondence of foreign military contractors who, like their military brethren, recorded their impressions of the nations in which they were stationed. Center collections range from the records of Admirals to seamen and soldiers, and include such material as letters among five African American brothers and their parents during WWII while the young men were serving in various posts in the Pacific Theater. We have important files relating to non-shooting wars also. Our holdings are so rich in material documenting the Cold War, as it played out both domestically and internationally, that professor of History Marianne Kamp has created a new course titled “The Cold War in International Perspective” based on our collections. But out international collection content is even more eclectic. To cite two examples, the papers of Harry W. Bashore (1880-1973), an engineer, worked for the U.S. Bureau of Reclamation from 1906 to 1945. While much of his work was in the Western US, he also consulted on irrigation projects in Israel and helped work out a treaty between Pakistan and India over the use of the Indus River. Or consider the papers of Mildred Stead Capron (1899-1978), a photographer, author, and member of the Society of Women Geographers. 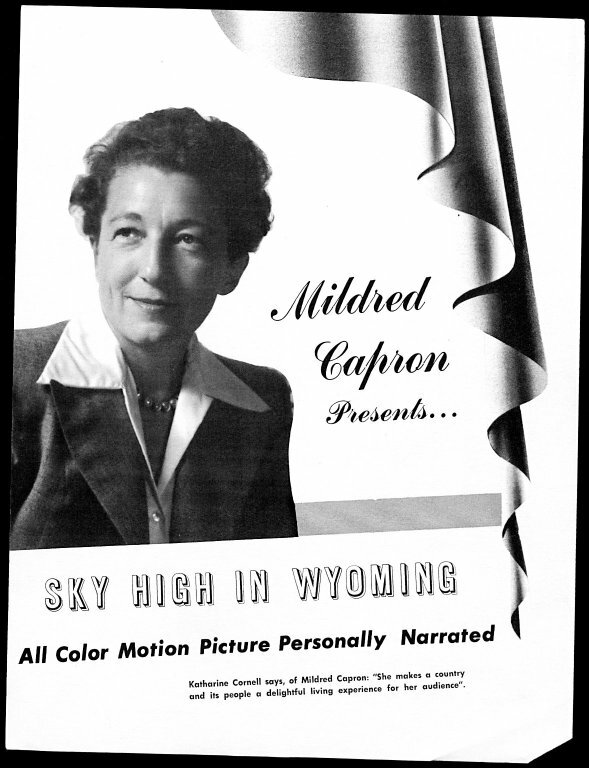 After arriving in Wyoming in 1935, she lived on the Arapaho Reservation and in Moose, Wyoming in Teton County where she operated Capron Film Productions. Many of her photographs and published materials are specific to Wyoming and the Arapaho and Shoshone tribes. But the collection also contains photographs, negatives, and 16 mm films reflective of Capron’s travels in Madeira, the Azores, South Africa, Portugal, and Ireland from the 1940s to the 1960s. Mildred Stead Capron papers, #3470, Box 3, Folder 3. University of Wyoming, American Heritage Center. Even more thoroughly international are the holdings of the Toppan Rare Books Library, whose holdings include incunabula and printed material from every inhabited continent on the globe, and from an ancient cuneiform tablet to the 21st century. Just as important as the holdings themselves are the broad range of UW courses that routinely make use of this material, ranging from world religions to international printmaking and beyond (even to international fly-fishing courses!). Curator Anne Marie Lane herself teaches full-semester courses based almost entirely on Toppan holdings, including “Exploration and Travel books,” Fall semester, 2012; “Nineteenth-Century British Books,” Fall semester, 2011; “Renaissance Books” Fall semester, 2009. And because of the international character of its holdings, Toppan has become a standard stop for UW’s English as a Second Language courses, which over the past five years have included students from Saudi Arabia (36), China (2), Vietnam (2), Iraq (1), Korea (1), Japan (1), Thailand (1), Laos (1), the Philippines (1), Mongolia (1), and Switzerland (1). However, it has only partly been because of the international content of our holdings that our patron base has been strongly international. Many of our world-wide researchers come to do research on US, and particularly Western, topics. Others, however, travel to Laramie specifically for international content. For example, the AHC’s 2007 Majewski Lecturer, Ian Phimister, from the University of Sheffield, UK, spoke on “Copper and Decolonisation in Central Africa: Sir Ronald Prain and the End of Empire.” He has written or co-authored several books on the economic and social history of Zimbabwe, as well as more than 50 articles on aspects of African history and British overseas economic expansion. The AHC’s list of researchers in our manuscripts and archives collections has long been significantly international, where for at least the past decade a minimum of a dozen nations have been represented, alongside patrons from all 50 states. During the past five years alone, our foreign researcher totals have been: Australia (14), Belgium (2), Canada (76), Chile (1), Columbia (1), Denmark (2), England (88), Finland (2), France (10), Germany (11), Ireland (6), Israel (1), Italy (4), Japan (5), Mexico (4), Netherlands (11), Norway (10), Philippines (1), Poland (2), Singapore (1), Spain (2), Sweden (1), Switzerland (4). In addition, approximately 15% of our 60,000+ unique website visitors annually (including to our 125,000+ items of digitized collection content) indicate they originate in domains outside the U.S. Some of us have been fortunate enough to develop professional friendships with colleagues from Canada to Japan to the Netherlands and beyond. …Our diverse collections support casual inquiry and international scholarship; most importantly, we play an active and creative role in the teaching and research missions of the University. Our Vision: The American Heritage Center aspires to be widely acknowledged—by the University community, by the people of Wyoming, by scholars world-wide, and by our professional peers–as one of the nation’s finest special collections repositories, bringing international distinction to the University of Wyoming by advancing scholarly research and education at the university and beyond. Outstanding curricular support at both the undergraduate and graduate levels, in an unusually wide variety of departments and colleges at the university, taking full advantage of the breadth of our collections…. We believe our mission, vision, and goals have been sustained and validated not only because of our overall large research numbers nor only because of our strong international patron numbers, but particularly because the Center supports a particularly large number of UW undergraduate researchers in a wide number of disciplines. Indeed, in most years UW undergraduates are the largest single user group of AHC researchers, compared to third largest on average for the nation’s biggest and best-known repositories. In sustaining, first and foremost, the UW curriculum, the Center believes its international components and perspectives indeed bring distinction to the University of Wyoming. Compare statistics derived from AHC’s in-house database with statistics reported in Jackie M. Dooley and Katherine Luce, Taking Our Pulse: The OCLC Research Survey of Special Collections and Archives (OCLC: 2010), p. 35. This entry was posted in International Collections. Bookmark the permalink.